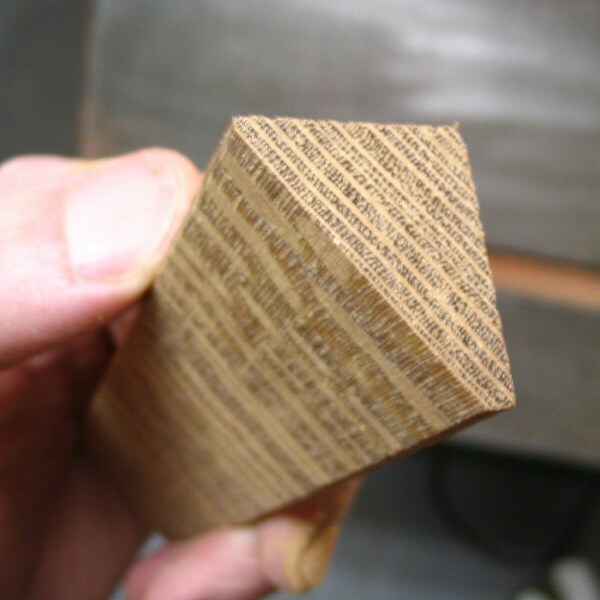 Color/Appearance: Has a very conspicuous flecking that gives this wood its namesake. 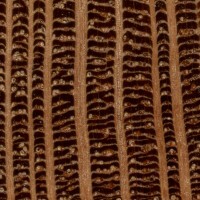 The wood itself is a medium to dark reddish brown with grey or light brown rays, which resemble the spots of a leopard. 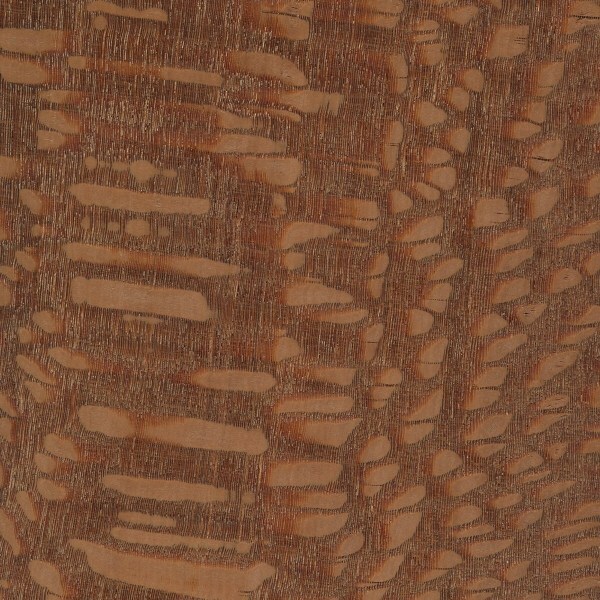 Like other woods that exhibit the strongest figure in quartersawn pieces, (such as Sycamore), Leopardwood has the most pronounced figure and displays the largest flecks when perfectly quartersawn; this is due to the wood’s wide medullary rays, whose layout can be seen the clearest when looking at the endgrain. Workability: Fairly difficult to work because of its high density and tendency to tearout during planing. 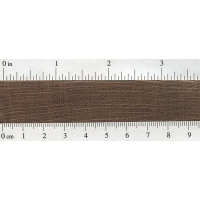 Leopardwood glues and finishes well. Allergies/Toxicity: Although there have been no adverse health effects reported for Lacewood in the Roupala genus, several other genera in the Proteaceae family have been reported to cause eye and skin irritation. See the articles Wood Allergies and Toxicity and Wood Dust Safety for more information. 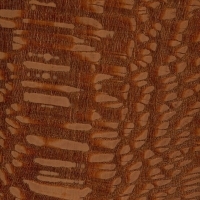 Pricing/Availability: Prices for Leopardwood tend to be medium to high for an imported wood. Common Uses: Veneer, cabinetry, fine furniture, musical instruments (guitars), and turned objects. Comments: Leopardwood is frequently confused with Lacewood, and is sometimes referred to as such. 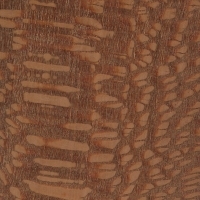 In its vaguest sense, the term “lacewood” is used to describe any wood that displays figuring that resembles lace, (which would technically include Leopardwood). Attempts to identify a specific board macroscopically may be difficult. 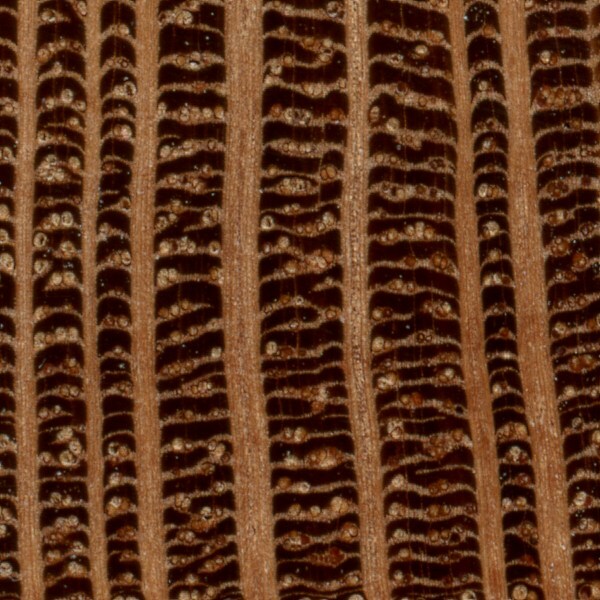 Two Australian species, Northern Silky Oak (Cardwellia sublimis), and Southern Silky Oak (Grevillea robusta) can both look very similar, and are sometimes sold as Australian Lacewood. 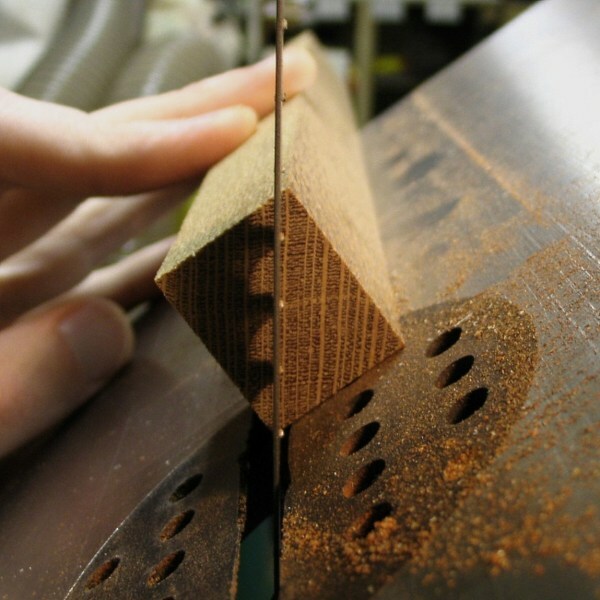 Scans/Pictures: Note the pair of pictures demonstrating the use of a bandsaw in resawing a small piece of Leopardwood to fully display the ray flecks in the wood. My 25 year old son was killed in car crash earlier this year and so I just finished an intarsia project as a Christmas present for his girlfriend. She loved sunflowers and my son grew them for her and they called each other two-peas-in-a-pod. I used leopard wood for the center of the sunflower. Here’s something I recently made from Leopardwood. It’s a single piece, with the center cutout and filled with polyurethane resin, then sculpted afterwards. A little confused…. 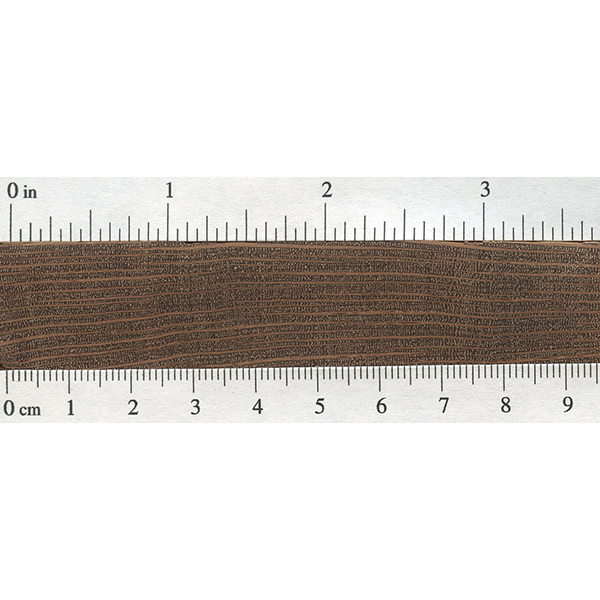 “Leopardwood has wider spaced parenchyma bands: approximately 3-4 per mm versus 5-6 per mm with Lacewood.” 3-4mm doesn’t seem to be wider than 5-6mm. You have to keep in mind that the number is “per mm”. For reference on a road or walking path, if I said that there are 4 distance markers per mile, that would mean that the markers on the path were spaced wider than if I said that there were 6 distance markers per mile. Think of the parenchyma bands as “distance markers” — but on a much smaller (mm) scale. Hopefully that makes sense. Hello, I recently tried to turn a bowl out of Leopardwood. At first the results were beautiful. I left to go to the store and when I returned the bowl, which was only about 60% complete, had cracks all around the outside but not on the inside. I don’t know why this happened. Any ideas? Hey Eric, I’m a small shop knife maker and stumbled across your website a couple years back and have been referring to it since. I just saw the posters and bought two, one for myself and one for my mentor. And just now came across the link and what led me to the page titled, ‘The Most Valuable Wood in the History of Mankind.” Nice! How stable is South American Leopard Wood? It has a T/R ratio of 2.5 which seems vey high! How stable will or would it be musical instruments? Would it cause shrinking or expansion problems, which would or could lead to cracks & or warpage in Guitars & Dobros ? I’m doing my first Stave Drum Shell with it & it is a strange but wonderful species! Very unique texture & has a really cool 3D appearance, will definitely be using it again! Did you ever get to build this? If so how did it turn out? Any pics? Is Leopardwood good for counter top?